Homage to Students. 2017. Made for Race and Revolution: Still Separate – Still Unequal at Smack Mellon. Crochet, soft sculpture, embroidery, antique embroidery hoop, leather glove, found lace embroidery, buttons, beads. Approximately 42″x20″x2.5″ as installed (dimensions variable). Approached by curator, Katie Fuller of Race and Revolution, who collaborated with Larry Ossei-Mensah to produce Still Separate – Still Unequal, an exhibit about school segregation at Smack Mellon, summer 2017, I created this homage to past students I’ve encountered as a teaching artist traveling all over New York City and New Jersey. The crocheted faces are an abstract map loosely representing the race, ethnicity, countries of origin of students in Ridgewood, Queens; Flatbush, Brooklyn; Fort Greene/Clinton Hill, Brooklyn; Jersey City, New Jersey; Carroll Gardens, Brooklyn. Techniques incorporated (crochet, embroidery, soft sculpture, assemblage) represent techniques I’ve taught to adults and children. The crocheted mandalas refer to a lesson I taught emulating Xenobia Bailey’s large-scale crochet work. Embroidered texts are excerpts from artwork and letters I received from elementary and middle school students sharing how art class transformed them. 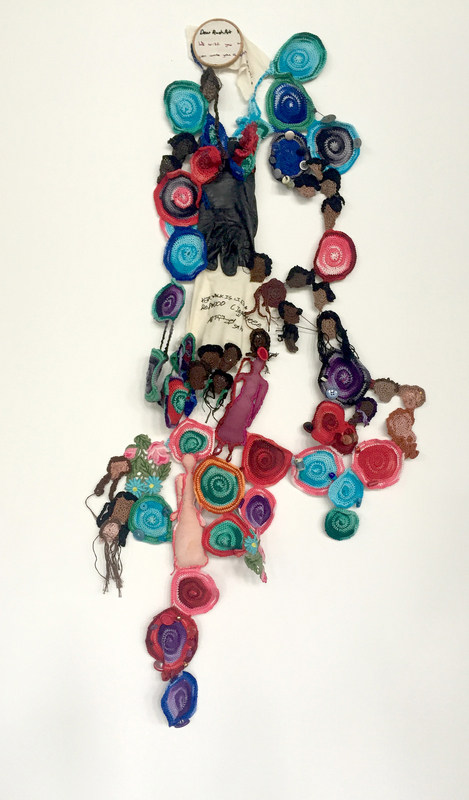 This piece includes donated objects (dyed fabric by Andrea Burgay; an antique embroidery hoop and torn, leather glove from students at Book Arts Round Table in South Orange, NJ); and an embroidered lace scrap I rescued from a recycling bag during my daily run in Cobble Hill, Brooklyn. One of the places I experience the most income disparity is in my South Brooklyn community. I live near public housing and brownstones that sell for millions of dollars, increasingly to well-known actors. Living in a rent stabilized apartment on a modest income, I’m increasingly aware of being a neighborhood outlier. “Rescuing” a textile remnant from an unknown neighbor seemed an appropriate illustration of gaps in income and access to material goods, only one aspect of segregation.